This section presents an overview of SurveyGold. It helps you understand what the application does, how to navigate the application and how to get help when you need it. SurveyGold exists to make it quick and easy to create and conduct a survey as well as viewing and analyzing the results. Online features of the SurveyGold application are enabled via SurveyGold online services. Some online services are available to all users. Other online services require a paid SurveyGold subscription service. SurveyGold provides a simple way of navigating. You get from one feature to another using Tab Folders, Button Bars, Back Button and Popup Menus. Tab Folders serve as the main menu to application features. Tab Folders normally appear on the left. They can optionally be set to appear on the top via an application preference. Track the pulse of all of your survey activity, search for text in surveys, update your survey activity. 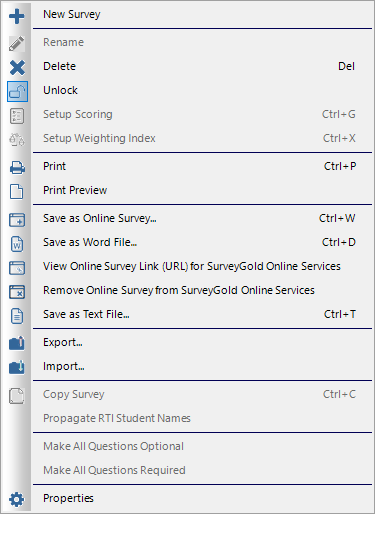 Create, maintain and delete surveys and their related sections, questions and respondents. Conduct kiosk surveys, field surveys, share responses and enter responses from in-person or paper surveys. 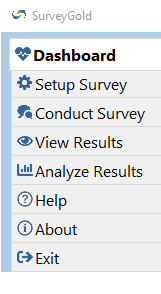 Interact with summary views of survey responses, created filtered views and drill down for more detail. ​Create a variety of reports, convert responses to other data formats and edit responses in batch. View software version and subscription information, check for software updates, view the license agreement. Set application preferences and access learning resources including video tutorials and the user guide. Button Bars provide access to commonly used application features for the currently displayed panel. ​Move your mouse over a button to display a description of the action the button performs. Note: Only the most commonly-used features for the panel are available via a Button Bar. All features for a given panel are available via Popup Menu. Each panel displays a unique Button Bar at the bottom of of the panel. The Back Button exits the currently displayed panel and returns to the previous panel. The Back Button appears near the top on the left. Popup Menus provide access to application features for the panel or for the currently selected item in the panel. Note: A few panels do not have Popup Menus. The Popup Menu appears by holding down the right mouse button and clicking. Many buttons and tabs in the application provide a popup description when you move your mouse over the button or tab.